Dixon took home 53 points from Phoenix last race after leading 155 of the 250 laps. His win, which came under caution, put him in second place in the points — a five place improvement from where he was at before the race. Pagenaud’s second place finish was good enough to get him to first place in the championship with a four point lead on Dixon. Montoya is nine points out from Pagenaud with 74 points. Power gained some much needed points (35) after missing the first race, so don’t count him out of the championship just yet. The season’s still early and there are lots of points left to be earned. That being said, he can’t afford three DNF’s like he had last season going forward. Every race is going to be important. 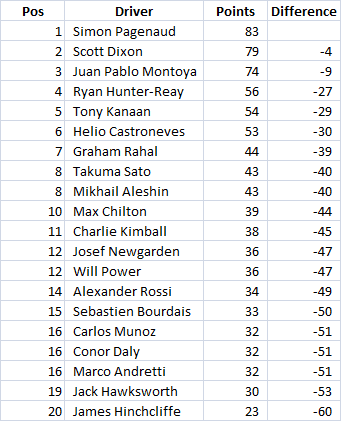 Once a couple more races are completed and the standings are less susceptible to drastic change, I’ll be including a “one race change” value in these championship updates. Who’s On Pace for the Title?